This classic Chicken with 40 Cloves of Garlic and Potatoes is a delicious dish made of roasted chicken, garlic, thyme, tarragon, white wine, plus the addition of potatoes. It is super satisfying and easy enough to make once a week. First of all, I consider myself something of an expert on delicious, yet easy chicken dishes. So I can say with a certain degree of confidence that this dish is a winner (winner chicken dinner?). Now, my goal is to master each and every classic chicken dish, as well as create a few of my own along the way. Chicken with 40 Cloves of Garlic has been on my chicken to-do list for a while. After fiddling with a few recipes (see recipe notes) I settled on my own adaptation, and am happy to say that this dish is truly a keeper. 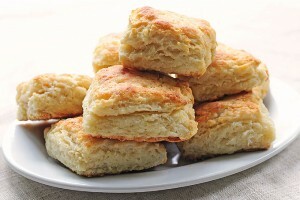 With simple ingredients, and very little preparation, no wonder it has remained a favorite classic throughout the years. If you’ve never made Chicken with 40 Cloves of Garlic, try this recipe soon and I think you’ll agree. Now, I know there are those that don’t care for garlic. Garlic is too strong, they say. However, you will find the garlic in this recipe mellows and becomes even slightly sweet from the roasting. 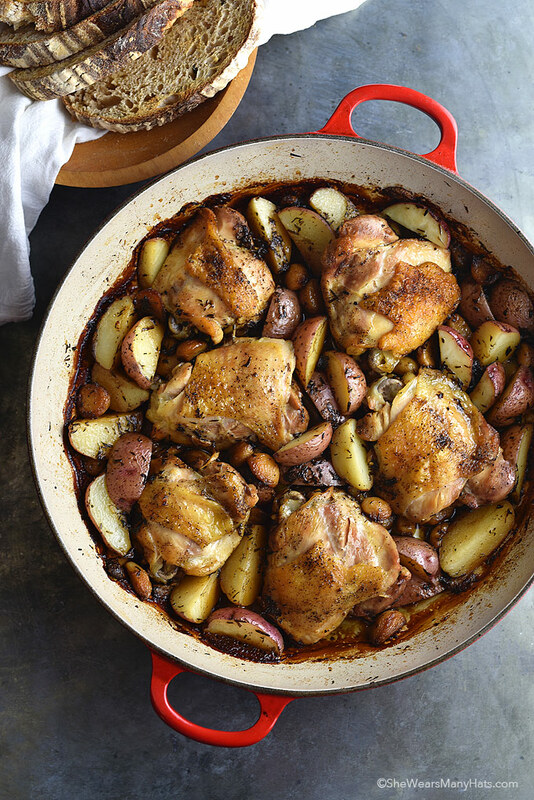 Garlic always pairs so nicely with chicken, and with the addition of potatoes, this is an easy one pan meal you will find so satisfying. Serve with a nice green tossed salad and maybe some crusty bread to soak up all of that saucy goodness and you are all set. 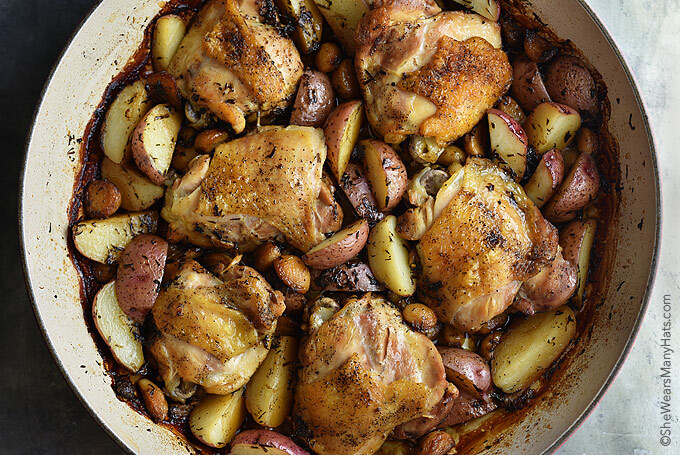 Chicken with 40 Cloves of Garlic and Potatoes is a fabulous dish for serving a group. The recipe serves four people, but it can easily be doubled, or tripled to accommodate a larger group. Also, a large roasting pan works nicely for doubling the recipe. Chicken with 40 Cloves of Garlic is a delicious dish of roasted chicken, garlic, thyme, tarragon, white wine, plus the addition of potatoes. 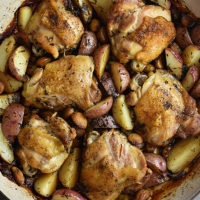 Heat large Dutch oven or heavy bottomed oven safe pan with lid over medium heat; add olive oil, when oil ripples, add seasoned chicken to pan; brown on both sides, starting with skin side down, about 5-6 minutes each side. Remove chicken to plate; set aside. Lower heat to medium low. Add garlic cloves, tarragon and thyme to pan, cook stirring occasionally for 3 minutes, until garlic is slightly beginning to brown. Add 1/2 cup wine to pan and cook for 2 minutes, stirring and scraping any brown bits from bottom of pan. Using the back of a fork slightly mash 1/4 of the garlic cloves. Add chicken stock; bring to a simmer. Add quartered potatoes, salt and pepper. Stir to coat potatoes. Tuck browned chicken into pan in a single layer. Cover and bake at 350-degrees F for 1 1/2 hours. To create sauce, remove chicken and potatoes from pan. Heat pan over medium-low heat. Whisk in 1/2 cup dry white wine, cook at a low simmer for 3-4 minutes, scraping up brown bits from pan. *I prefer to use all chicken thighs for this recipe. Thighs are relatively inexpensive, they don’t dry out as much when roasting, and I find they are more flavorful too. ** Potatoes are optional and may be omitted without changing any other ingredients. Originally published October 12, 2016. Probably 30 years ago I saw 40 clove chicken on t.v. and to get the recipe I bought the most beautiful cookbook I’ve ever owned!! It was put out by the Gilroy Garlic Growers in Gilroy, CA. the garlic capital of the U.S.!! Can this recipe be done in a slow cooker? I’m sure it could be converted for a slow cooker but I have not made it that way yet, so I don’t have instructions for making it that way. Sounds delicious! Looking forward to trying it. Oh my, sister! Made this last night and Joshua says, “Wouldn’t it be great to have a mom who was a food blogger and made amazing food all the time? !” That was his twisted way of saying he liked his dinner. I made this last week, it was superb! I halved it for just the two of us. Used skinless boneless thighs (dredged in flour) and Idaho potatos bc that’s what I had on hand, and only fresh thyme, no tarragon–oops– I forgot to make the gravy. No worries it was all amazing! Oh yeah, I smashed the garlic before adding to the pot just because that’s what I’m used to doing…. This was a fantastic recipe. Hi, what would you suggest I use as a substitute for the white wine? I would use a combination of white grape juice and chicken broth, possibly with a splash of lemon juice (a tablespoon or so). It will not be the same depth of flavor that the wine adds, but should be quite tasty. WHY IS EVERYTHING 1 1/2 years old.. ???? I’ve been making this for years and it is divine!!! The garlic gets sweet as it cooks and is also great on crusty bread.